Introducing: Juwles Botanics & Skincare Oilixirs - Review & UK Giveaway! Being a serious lover of all things skincare related means that I'm always on the lookout for new products to try out, and my latest discovery comes from a small, independent British company called Juwles Botanics & Skincare. 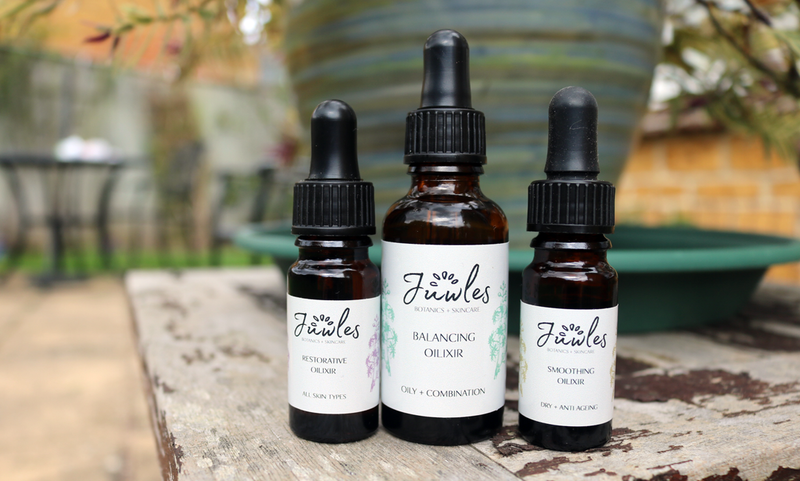 Juwles are an all-natural, cruelty-free, 100% vegan brand whose products are handmade in small batches in Birmingham, by founder Asma Juwles and her aromatherapy team. Asma's passion clearly lies in her work as she is a professional aromatherapist, massage and skin therapist, and her brand certainly reflects this. She puts a strong emphasis on 'less is more' when it comes to formulating her products, choosing to use only unrefined and pure natural ingredients, so everything is free from preservatives, fillers, parabens and synthetic ingredients. The first product launch from Juwles comes in the form of a trio of Oilixirs; highly concentrated facial oils which contain vitamins, minerals and botanicals to transform your skin naturally. I've had the pleasure of testing these out over the past month, so here are my thoughts! Formulated especially for oily and combination skin types, this is my favourite Oilixir out of the three as it suits my skin perfectly. It features a base of several natural oils such as Avocado Oil, Sweet Almond Oil, Evening Primrose Oil, Pomegranate Seed Oil and Rosehip Oil to nourish and brighten the skin, whilst essential oils of Clary Sage, Geranium and Lemon help to balance sebum levels, reduce inflammation and keep blemishes at bay. It smells strongly of Geranium which I love and the oil absorbs easily into the skin leaving it softer and looking clearer, plus you only need to use a few drops each time. For an evening face oil that all skin types can use, try the Restorative Oilixir. This one contains Evening Primrose Oil, Rosehip Oil, Pomegranate Oil, Avocado Oil, Sweet Almond Oil, Frankincense, Bergamot and Lavender to deeply nourish and hydrate the skin, making the complexion brighter and more glowy. I've been enjoying alternating this with the Balancing Oilixir in the evenings when my skin has been looking a little dull or feeling dehydrated, and it's been working wonders! If you have very dry or more mature skin, the Smoothing Oilixir will be the perfect choice for you. It features similar ingredients to the others, such as Avocado Oil, Pomegranate Oil, Vitamin E, Evening Primrose Oil and Rosehip Oil, but it also includes Frankincense, Peach Kernel Oil, Lavender and Ylang Ylang essential oils which really help to deeply moisturise dry skin, even out the skin's overall texture, smooth out fine lines and wrinkles, and improve skin's elasticity. Your skin will feel considerably softer, thoroughly hydrated and more plumped up after just the first use. Fancy winning one of these Juwles Oilixirs to try out for yourself? Simply follow the instructions in the Rafflecopter below! Two winners will each win an Oilixir of their choice - good luck! Giveaway open to UK readers only and ends next week - 16/08/2017. My face needs all the help it can get to be honest. I'm looking a bit tired right now!! I've not heard of this product before- would love to win to give it a try. I love to try new skincare products. This would really suit my oily/combination skin and its cruelty free. would love to try something that will help my skin. I love trying new skincare and I am a fab of oils especially. I would love to win this to give my skin a nice treat with some great products. Some skin indulgence would go down well - always keen to try new products. I would love for my skin to glow more, it always looks tired despite being only 31 and a non-smoker. Because my skin is terrible. Even at 32 I still get spots, and my skin tone is always uneven. I struggle to find good cruelty free products so this sounds great!